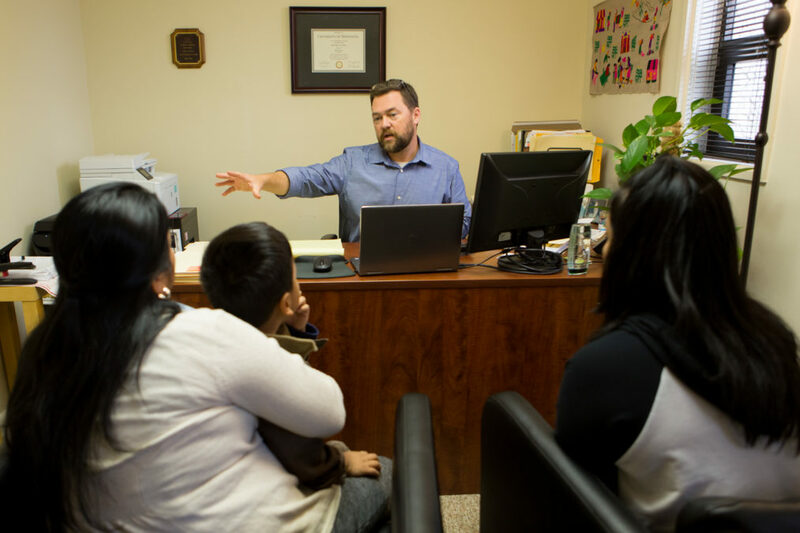 Immigration attorney Justin Mixon meets with clients at his office near Philadelphia. Mixon says government-funded lawyers are told not to challenge custody decisions for migrant children being held in shelters. Without legal help to protest the government’s decisions, many migrant children end up separated from their families for longer, languishing in detention without an avenue for appeal. By law, migrant children in federal custody are supposed to get free legal help. But in the fraught relationship between the lawyers who advocate for detained migrant children and the agency that holds them, the Office of Refugee Resettlement wields powerful leverage: It pays the lawyers’ salaries. 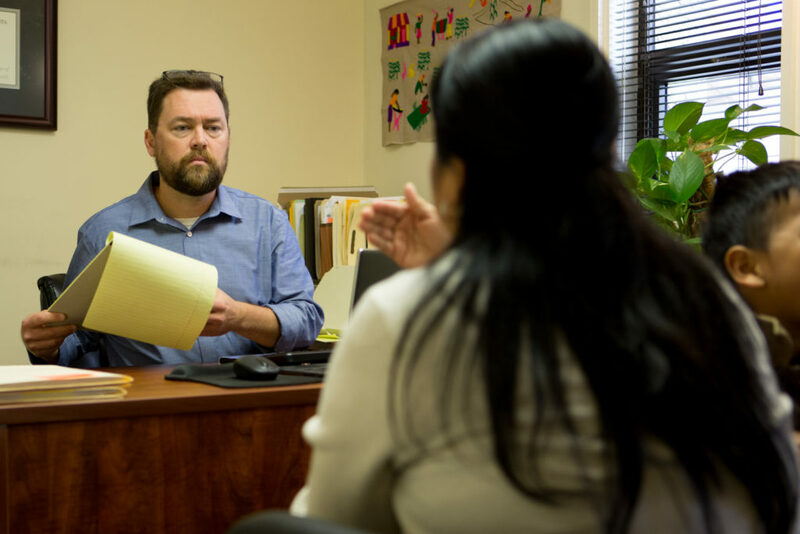 To meet its obligations under federal law, the refugee agency funds grants to 35 legal service providers in 19 states. The local groups are paid to give presentations about immigration law to the children, represent them in immigration proceedings and recruit other lawyers to provide pro bono legal aid. For most migrant children detained alone, the only lawyers they’ll ever see are being paid by the same agency that’s holding them. The arrangement highlights a significant conflict of interest between the legal interests of migrant children and the federal authorities that will determine their fate. “I was instructed that I could not assist detained children (to) challenge ORR’s release or placement decisions, no matter how arbitrary or otherwise unlawful ORR’s decisions appeared,” said one attorney, Justin Mixon, in a court declaration filed in April. Mixon worked for one of the groups with a legal aid grant, HIAS Pennsylvania, from 2014 to 2017. “Both ORR and Vera Institute informally discourage Vera-funded lawyers from taking any legal action against ORR lest they cut off funds entirely for assisting unaccompanied minors,” wrote another attorney, Lorilei Williams, in a separate declaration. Williams worked for government-funded legal aid groups in Houston and New York from 2012 to 2016. More than 40,000 children were placed in the custody of the Office of Refugee Resettlement in 2017, nearly all of them from Guatemala, El Salvador and Honduras. About two-thirds were boys, and two-thirds were between the ages of 15 and 17. Typically, the children have been found crossing the border alone, though under the Trump administration’s family separation policy, more than 2,600 wound up with the refugee agency after being taken from their parents at the border. Some face immigration court alone, while they’re still detained by the refugee agency; others released to family members often wait longer for their day in court, where they’ll face long odds of winning asylum or another claim to stay in the country. Poonam Mantha, a Vera Institute spokeswoman, said members of the team that runs the program were unavailable for an interview but offered a brief comment: “Vera plays an intermediary role, and always encourages all attorneys to do absolutely whatever they need to do to serve their individual clients,” she said. The Administration for Children and Families, the division of the Department of Health and Human Services that oversees the federal refugee agency, has yet to respond to a request for comment. The problems lawyers cite date back a decade or more, but the conflict has taken on greater significance under President Donald Trump. The officially reported average length of stay in federal shelters has reached almost two months, and the population of children in federal custody has reached an all-time high of 13,200. That growth is not because more children are entering the system; it’s because the government has dramatically slowed the pace at which it chooses to release them. Immigration attorney Lorilei Williams worked for federally funded legal aid programs in Houston and New York, where she said she was told that suing for her clients’ release could jeopardize her funding. For some attorneys and legal aid workers, the current system means children are held in government custody far longer than necessary and without a reasonable way to appeal their cases. Much of the process is shrouded in secrecy. But Lorilei Williams, the attorney who has worked for legal aid programs in Houston and New York funded by the Office of Refugee Resettlement, got an inside look at the government’s process for determining custody of migrant youth. She was granted access to shelters, secure lockups and the Shiloh Treatment Center, where the refugee agency sends youth for psychiatric treatment, often without the consent of the children or their parents. That kind of access to clients is regularly granted to attorneys who are funded by the refugee agency – another incentive not to challenge the agency’s decisions. Williams gave legal-rights trainings and helped some children with their immigration cases. In the course of her work, she met children who’d been in custody far longer than she believed was appropriate. The refugee agency detained one 16-year-old Mexican-born boy for five months, even after Williams discovered he could claim U.S. citizenship, because officials “were concerned about his father’s criminal history,” Williams said in her court statement. Another of Williams’ clients, William Alberto Alvarez Argaeta, arrived in the U.S. in 2011, when he was 9 years old. He’d been traumatized by a year living on the streets in El Salvador and was sent to Shiloh for psychiatric treatment. He’d planned to reunite with his parents, who had crossed the border separately and were living in Dallas. But, Williams said, “ORR refused to release William,” or explain why. In this case, Williams found a workaround: She asked the immigration courts to recognize that the boy wasn’t competent for removal proceedings. Just before a scheduled court hearing on William’s competency, the Office of Refugee Resettlement released the boy to his parents. “He had by that time spent almost a year and a half needlessly detained,” Williams wrote. According to Williams’ statement, the boy died in a fishing accident in 2016. This tension dates back to the beginning of the legal aid program, lawyers say. The William Wilberforce Trafficking Victims Protection Reauthorization Act of 2008, signed by President George W. Bush, assigned the Health and Human Services Department to help unaccompanied minors get legal representation. To meet its new obligation, the department paid the Vera Institute to develop a legal aid program. It works across the country, developing, managing and studying programs focused on prison reform and access to legal representation. With one brief exception, Vera has continued to run the Office of Refugee Resettlement’s entire legal aid program. Today, that legal aid grant is Vera’s single largest revenue source, according to tax filings and federal spending records, worth more than $50 million a year. The unaccompanied minors program at the Office of Refugee Resettlement was designed as a sort of revolving door. Children typically would spend a few weeks in the agency’s custody, after their apprehension by border authorities and before their release to a family member in the U.S. But there were always exceptions, outlier cases in which the process broke down. A child deemed dangerous by federal officials might be placed in a county-run juvenile lockup. Or the agency might balk at releasing a child to a parent with a criminal record. In child welfare cases outside the immigration system, these decisions are made by a state agency with a judge’s oversight. But in the immigration system, refugee agency officials have wide leeway to make decisions and almost no outside oversight. Children have spent more than two years in the agency’s custody. Under an agreement reached with the government in 1997 – the so-called Flores settlement – children have the right to challenge their detention. But the refugee agency doesn’t provide an outside appeal process, so the only option is a court challenge, such as a writ of habeas corpus, a lawsuit claiming that a child is being wrongly detained. But, according to Williams and other attorneys, the government-funded lawyers – the only ones children can access – won’t file those cases. 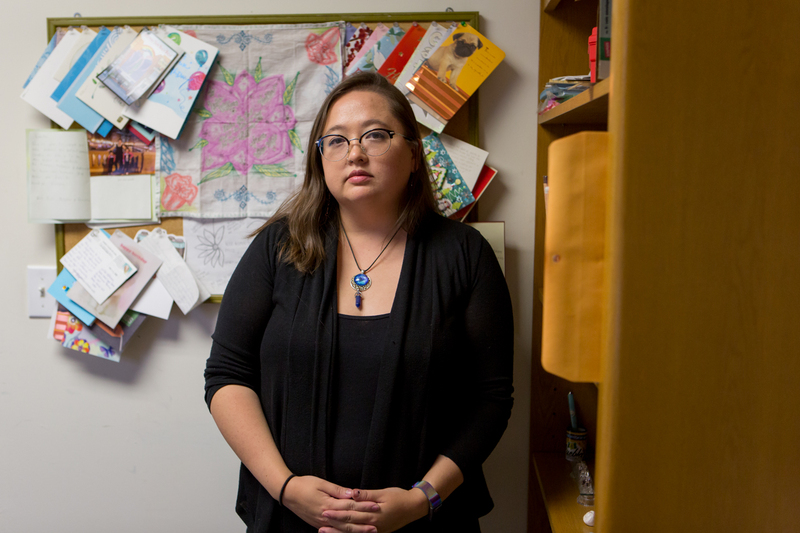 While she worked for Vera-funded groups, she sometimes would try to connect children with other lawyers who could get them released. The cases are complex and time-consuming, especially for a small legal aid group responsible for helping thousands of children at once. But for some children, it’s their best remaining hope of getting a judge to reconsider their detention. A Reveal analysis of federal court records turned up 23 lawsuits demanding that the Office of Refugee Resettlement release a child or a group of children. Just one – a suit related to the Trump administration’s family separation policy – was brought by an attorney employed by a group that received a federal grant to represent unaccompanied minors. A lawsuit filed in June directly challenges the Office of Refugee Resettlement on its refusal to allow lawyers to challenge custody decisions. The case is being brought on behalf of seven children held in its custody this year, including a 13-year-old Guatemalan boy called “Lucas R.” who was held at the Shiloh Treatment Center and was in custody from February through September. Williams’ former employer, Catholic Charities of the Archdiocese of Galveston-Houston, has the local grant to provide legal services to children at Shiloh. But according to the lawsuit, children in custody have been unable to get help from those lawyers to challenge their detention or the medication they’ve been prescribed. “ORR blocks lawyers from representing detained children with respect to placement, non-consensual administration of psychotropic medications, or release to available custodians,” the suit claims, even though Congress has set aside funding to represent children in “legal matters” while they’re in the refugee agency’s custody. Holly Cooper, one of the attorneys in the case and a law professor at the University of California Davis, said groups that accept funding from the Office of Refugee Resettlement, through Vera, are making a calculated choice: to help children in custody, but only as much as the government allows. Cooper said she’s complained directly to people who work for Vera about their “acquiescence” to the agency. “I feel they’re complicit in this scheme that doesn’t allow for advocacy for detained children,” she said. The Trump era is a particularly risky time for a program like this. Earlier this year, the Justice Department announced it was canceling funding for another Vera-run legal orientation program, for adults detained by ICE. Two weeks later, the department reinstated the program, but said it would continue studying whether it was worth the money. In 2017, the Office of Refugee Resettlement instructed Vera-funded groups to stop representing minors after they’re released from custody. Vera passed along the direction to local legal aid groups but wouldn’t comment publicly about the change. The most public signal of the group’s approach to navigating this minefield may have been in February. At the time, the refugee agency’s director, Scott Lloyd, was facing a federal court challenge over his directive that children in the agency’s custody not be allowed to get abortions. In a Feb. 2, 2018, email first reported by The Washington Post, a Vera official named Anne Marie Mulcahy passed along a directive from the refugee agency that Vera-funded attorneys shouldn’t mention abortion to minors in agency custody. “We know for a fact that there is a very real risk to the entire legal services program for children in (Office of Refugee Resettlement) custody if issues other than immigration are addressed in consultations or representation, the abortion issue in particular,” she wrote. In particular, she directed lawyers to remove any mention of abortion from their “Know Your Rights” pamphlets. The law isn’t clear about exactly which legal services the government must provide. But in the system the government has devised, it limits children’s access almost exclusively to lawyers it funds, and then narrowly dictates what kind of legal help they can offer. Under Vera’s contract with the government, one of those jobs is to recruit pro bono legal help for detained children. But according to Williams and other attorneys familiar with the system, some local groups rarely refer cases out. Even these referrals are subject to the government’s approval, they say. Megan Stuart, an attorney who until recently represented homeless and LGBT immigrant youth with the Urban Justice Center in New York, said one of her clients referred this way was a Rwandan girl who fled her home country after being tortured because of her sexual orientation. She was detained in New York for months while pregnant, just shy of her 18th birthday, as Stuart repeatedly asked the Office of Refugee Resettlement to release her. The government finally released the girl only after Stuart threatened a federal lawsuit over her continued detention, Stuart said in a court statement. After that, she said, the referrals stopped. “Though I am uniquely situated in terms of capacity and expertise to represent youth in ORR detention, I have been told that because of my advocacy for my clients, Vera-funded providers are not to refer cases to me, or risk losing their funding,” she said.